Do you love to travel? I do, I love experiencing cultures, eating the food, seeing the sights and spending time with the people I love exploring new locations. Let me introduce you to Prudence, she loves to explore. Riding the train system is her preferred method of transport but I’m sure if given the opportunity she would jump at the chance for any adventure. Wouldn’t she be perfect painted on an ornament or framed for that special adventurous person? 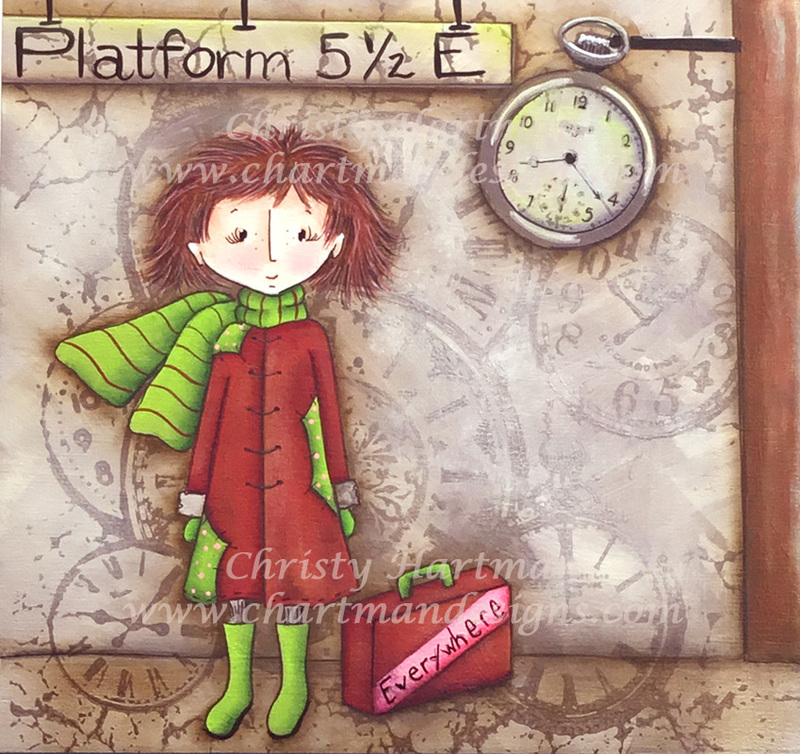 She would be perfect painted for someone who loves to travel or is beginning a new life adventure? I specifically used a small square surface for ease of changing up the surface you wanted to use and used Acrylic paints. I used a tone on tone background and used parts of the background in the foreground. 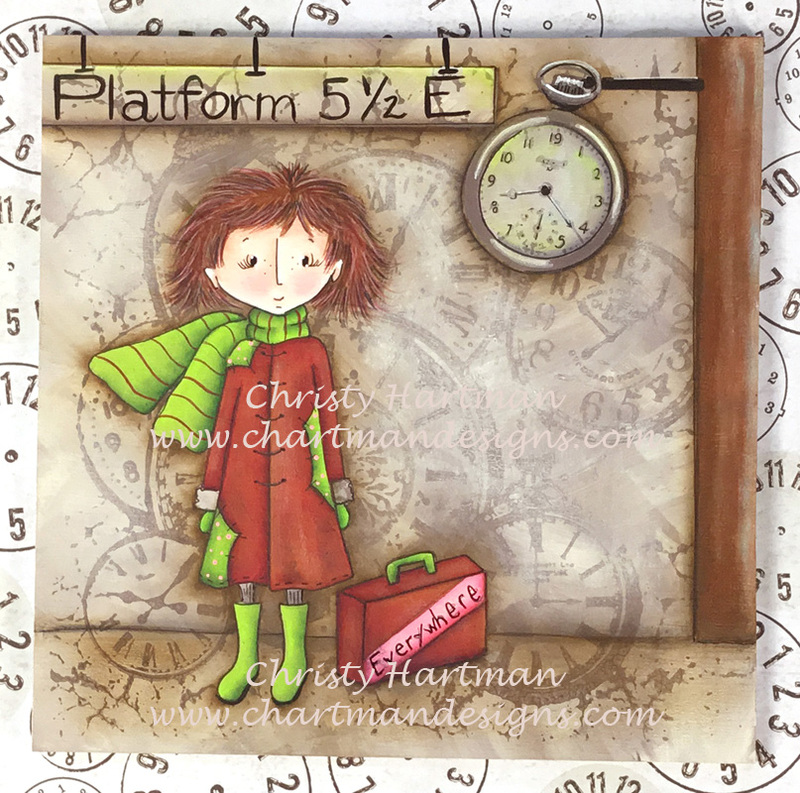 I used the Cling Clock Collage stamp from Stampendous to develop the background and placed it so that I could use the pocket watch as my train station clock. However I included in the line art for this pattern my own pocket watch illustration if you didn’t want to use the stamp in the background. For this piece I chose to use a background which allows for color and texture to be developed through the use of brush technique and stamping. The delicate design on the clock stamp adds an interesting texture which helps to develop the look of depth. I love this type of background, incorporating stamping adds to the mystery of the piece which I find desirable. I have included 8 full color photos and the line art to complete this project. You are purchasing the e-pattern for this project. Once payment has been verified you will receive a paid invoice with your GREEN download button attached. I have provided a PDF on my homepage explaining how to download patterns but if you have any questions please feel free to contact me.